The information we have gathered is to give a tiny glimpse into the changes this tree has seen. We hope to find out more about the land around it, the changes over the years to the farm and families that lived nearby, the railway coming and going, the festival coming and growing, to maybe give us a picture of how and why this tree escaped the saw and lived to see many a year. Susie, one of our volunteers on the Green Kids Field is also very involved in gardening, permaculture, and natural history. She started looking into the wildlife of the tree, and talking to people who gathered around it. 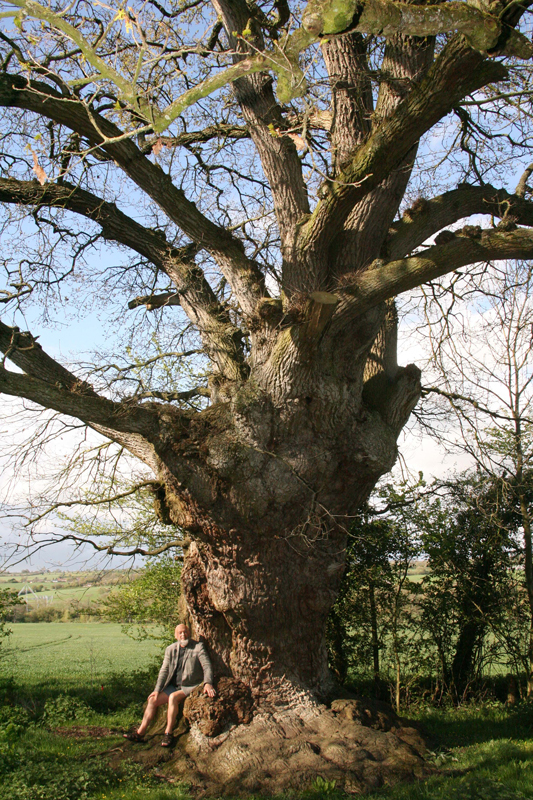 We started researching its history, its folk law, its “place” in the farm – and soon realised that by studying one tiny piece of England – One Oak Tree – you could pretty much cover the last 500 years of English history. We call it “Micro-history” – and we love it. We are trying to build a picture of the tree from its beginnings to what it is now. Much of what we have discovered is fact, some is hearsay, some is the surmising of knowledgeable people who can make good assumptions about it, and some may be pure fantasy. We have tried to credit where our information comes from and we would like to thank every one who has contributed. When our oak was a seedling, sprouting from an acorn one spring in the early 1500s, Henry VIII was crowned King of England and Da Vinci painted The Mona Lisa. Oak wood was primarily used for house building. Parliament passed Acts to enclose Common Ground – hedgerows being were planted to join with old hedges. Woods were taken from the Church and sold by the Crown – new owners exploited the land, turning woodland into arable plantings. Many woodlands fell into disrepair in the mid-14th century as the Black Death claimed nearly half of the population and so the area of farmed land fell sharply. Over the next 2-3 centuries, many open fields and much common land was enclosed, dispossessing poorer farmers and labourers of their land. 1600s – At 100 years, two people could join their hands around its trunk. In London the Great Fire followed the plague, Civil War raged and Cromwell took Parliament – and marriages would still have taken place under the boughs of the Oak. Acts of Parliament were passed to preserve and plant Oaks – for ship timbers – as woodlands were poorly managed. The Monarchs Way. – “The Monarchs Way is a 615 mile long footpath that approximates the escape route of King Charles the Second in 1651 after being defeated in the Battle of Worcester.” The Monarchs Way comes very close to our Oak Tree. The Battle of Worcester took place on 3 September 1651 in Worcester, and was the final battle of the English Civil War. Oliver Cromwell and the Parliamentarians defeated the Royalist forces of King Charles 11. The 16,000 Royalist forces were overwhelmed by the 28 thousand strong “New Model Army” of Oliver Cromwell. King Charles 11 fled the battle and went from Worcester to Stratford upon Avon, Stratford upon Avon to Charmouth, and Charmouth to Shoreham – this whole footpath journey is now known as The Monarchs Way. 1700s – 200 years old and our tree was prime timber. Prominent trees were landmarks in the countryside, providing meeting and trysting (lovers meeting) places. Boundary trees defined land ownership and appear in old deeds. Large trees were also used as ‘gallow trees’, and ‘gospel oaks’ were part of the beating the boundaries of Parishes. Nelson fought the battle of Trafalgar; Wellington the Battle of Waterloo and Captain Cook sailed around the world. The 1700s saw a dramatic change in the appearance of the countryside as Enclosure increased in line with demand for food and agricultural advances. New hedges were planted to exclude livestock from cropped fields. Each common land enclosure required an Enclosure Act to be passed through Parliament. These were at their peak between 1750 and 1850 to satisfy a growing and increasingly industrialised population. 1850s – During the next 150 years, the pattern of hedges was influenced by canals, railways and roads as new transport systems cut through the countryside. This changed field shapes and new hedges were planted to exclude wandering livestock. The period 1870 – 1951 was on the whole a period of agricultural diversity in which there was less money to spend on either maintaining or destroying hedges. The latter half of the 20th Century has witnessed hedgerow decline once again with agricultural intensification and mechanisation requiring more regular and larger field shapes. • At the end of each May Oak Apple or Royal Oak Day commemorates the restoration of the monarchy in 1660. Up to the 1940’s children wore Oak leafs and churches were decorated with leafy branches. • Oak leaves and acorns are traditionally used to symbolise strength and longevity. The Oak represents positive power and inner strength. • The bark, leaves and acorns all have healing properties and uses. • The druids revere the oak, and mistletoe grown upon it, is sacred.